WASHINGTON, D.C. – The Raiders are remarkably healthy heading into Sunday night's game against the Washington football club. The entire 53-man roster practiced fully on Friday, before heading to the nation's capital. That includes veteran cornerback Sean Smith, who missed the previous game with a neck injury. 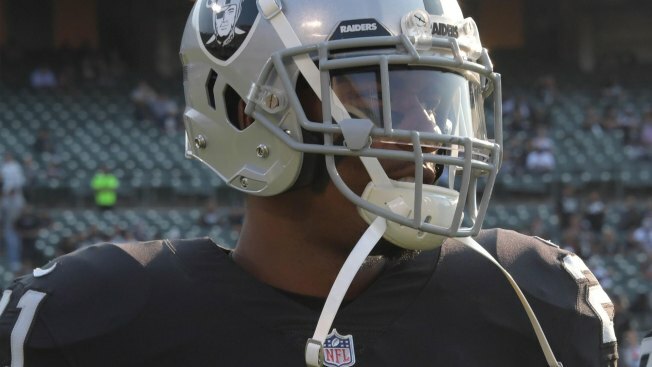 A shoulder ailment cropped up during the week, which prompted the Raiders to label him questionable heading into Week 3. Smith's the only Raider on the injury report, and even he's in decent shape. "I mean we put it on there because there's still a little bit of a question," head coach Jack Del Rio said. "You don't have probable's anymore. Given the choices, I just left him that way." That means the Raiders are going to have some healthy scratches a week after Smith was the only injured player sitting out. Washington has some impact players on the mend. That included tight end Jordan Reed, who is questionable with a rib/sternum injury. He stands 6-foot-2, 246 pounds and is the type of receiving tight end that gives the Raiders fits. He has 1,638 yards 17 touchdowns the last two seasons, using good hands and a large frame to create mismatches in the secondary. It'll be key for the Raiders to defend him well if he's active, with Nicholas Morrow as a primary coverage option. "We're prepared to face him," Del Rio said. "We think he's a good player. We'll approach it that way and adjust if he doesn't go." Washington also lists starting inside linebacker Mason Foster and running back Rob Kelley as questionable.